Leveraging over the skills of our qualified team of professionals, we are instrumental in trading and retailing a wide range of Garments to our customers. These Garments are extensively demanded by our clientele due to various characteristics such as trendy pattern, skin friendly nature and flawless finish. Keeping track with latest market development we are actively engaged in offering attractive range of Day Wear Dress. The offered dress is designed with the help of premium quality chiffon and contemporary machines in compliance to set industrial standards. This dress can be worn by ladies in colleges, institutes and offices. 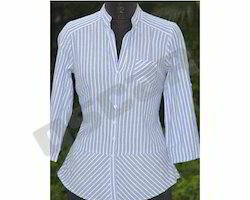 We deal an exquisite range of Short Sleeves Round Neck Blouses. We use premium quality fabrics such as silk, cotton, chiffon and others. 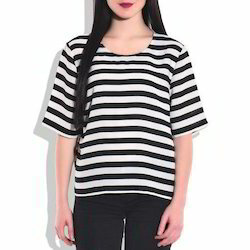 There are a variety of necklines available like round, v, collared and many more. This range of blouses is highly preferred by our clients as it holds immense fashion appeal and exhibits a blend of contemporary and modern design. Wether you have your designs ready for production or need some help in visualing your concept, we have years of experience in taking either formal or causal dresses from paper to cutting table. Set of shirt with skirt to wear office or causal.